There is a reason handgun hunters around the world today still deploy the 44 Magnum during their most important hunts, and it is not out of a sense of nostalgia. With the introduction of the Magtech 200 grain .44 Magnum Solid Copper Hollow Point, never in history has the power of large bore revolving hunting reached such astonishing heights. This round’s solid copper hollow point is perhaps one of the most devastating rounds to ever be developed for the .44 Magnum. 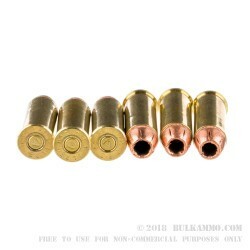 The 200 grain hollow point round is forged from a solid piece of copper, making for a round that is nearly impervious to deformation regardless of the density of the target surface, and is capable of crushing through bone and tissue of even some of the largest animals in North America to date. The 200 grain round travels at a muzzle velocity if excess of 1,296 feet per second, and delivers a frightening 746 ft lbs of energy upon impact on the target surface. 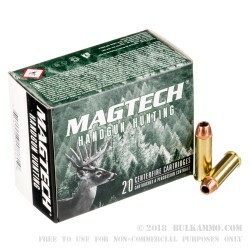 Due to the sheer velocity and power of the Magtech 200 gr. 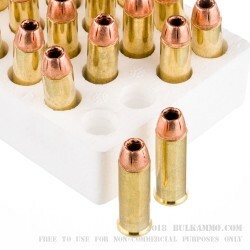 44 Mag Solid Copper Hollow Point, it is often unsuitable for self defense due to the high probability of perforation, however, it is ideal for defense out in the wilderness against black bears, mountain lions, and other territory animals that may pose an immediate threat to you life. 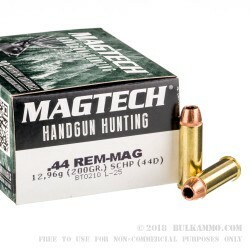 Handgun hunters looking for the ultimate solution for their high performance handgun hunting needs may never want to shoot another round in their life than the Magtech 200gr .44 Magnum Solid Copper Hollow Point.